Two food trends that don’t seem to be going away anytime soon are meals in bowls and meal prep. And it’s probably not a coincidence that meal bowls naturally lend themselves to meal prep too–the same components that can be assembled to eat right away can also be assembled into a container for later. We all want to eat healthier, but we also want to do it in a way that works with our schedules, and these kinds of recipes are a natural fit. These Cauliflower Falafel Power Bowls were made for meal prep–make the falafel and cauliflower rice over the weekend and divide them up into containers with hummus and other fixings for a lunch you can grab and take with you to work. Of course, they’re equally as good eaten right away, but I totally get excited anytime I find a recipe that I can make ahead. This recipe comes from Kelli Foster’s new cookbook, Buddha Bowls: 100 Nourishing One-Bowl Meals. I have dozens of Kelli’s recipes for The Kitchn pinned on my personal Pinterest account, so I knew as soon as I got this book in my hands that it! would! be! good! And it didn’t disappoint. 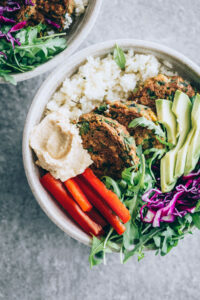 The basic concept of Buddha Bowls is a collection of balanced one-bowl means made with whole grains, protein, fruit and vegetables, and sauces that tie all the ingredients together. While the book isn’t exclusively vegetarian, there are enough meatless recipes in here to make it worth checking out even if you don’t eat meat. 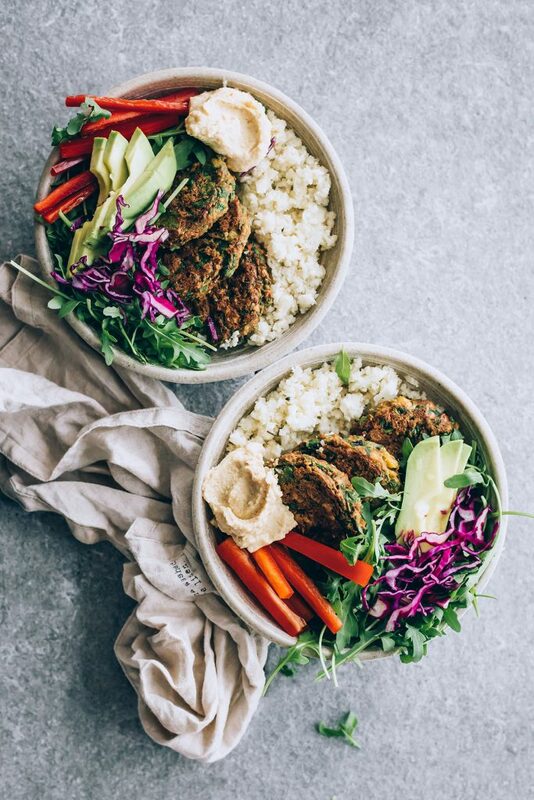 A few of my favorites include the Thai Coconut Curry Bowls, Za’atar Chickpea Bowls, and the Ricotta and Honey Roasted Plum Bowls with Crunch Buckwheat. Buddha Bowls © 2018 Quarto Publishing Group USA Inc. Text © 2018 Kelli Foster. First Published in2018 by The Harvard Common Press, an imprint of The Quarto Group, 100 Cummings Center, Suite 265-D, Beverly, MA 01915, USA. If using dried beans, add the chickpeas to a medium bowl and cover with water by at least 1 inch (2.5cm). Let them sit, uncovered, at room temperature for 24 hours. Add the drained chickpeas, onion, garlic, lemon juice, parsley, cilantro, cumin, coriander, cayenne, 1teaspoon (6 g) of salt, and ¼ teaspoon pepper to the bowl of a food processor. Pulse about 10 timesuntil the chickpeas are chopped. Scrape down the sides of the bowl, add the flour and baking powder, and pulse until the mixture is well combined. Scoop out about 2 tablespoons of the mixture and roll it into a ball in the palms of your hands. Transfer to a lightly greased baking sheet and use a spatula to flatten into a ½-inch (1.3 cm)-thick disk. Repeat with the remainder of the mixture. Bake the falafel until cooked through and tender, 25 to 30 minutes, flipping once halfway through. Heat the oil in a large skillet over medium heat. Add the riced cauliflower, za’atar, salt, and pepper, and stir to combine. Cook, stirring occasionally, until the cauliflower is slightly softened, about 3 minutes. To serve, divide the cauliflower rice and arugula among bowls. Top with falafel patties, bell pepper, avocado, sauerkraut, and a scoop of hummus.